At 37, Buttigieg dives into an official campaign for the Democratic nomination — and a shot to beat Donald Trump in 2020. 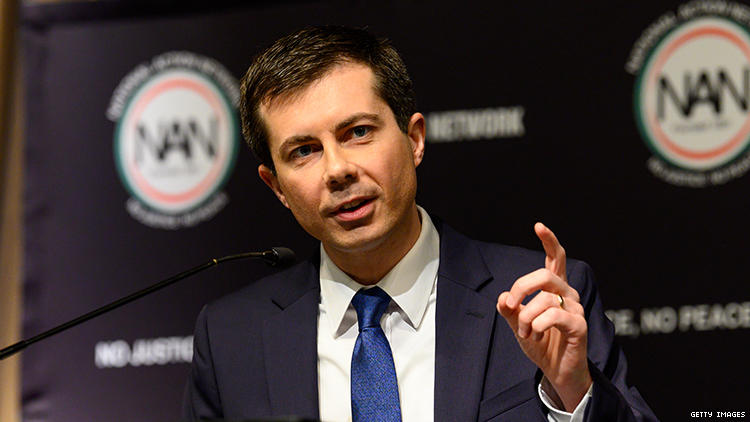 Pete Buttigieg officially announced his run for President of the United States on Sunday in South Bend, Indiana, Mayor where he currently presides as the midwestern city’s mayor. "My name is Pete Buttigieg, they call me Mayor Pete," he said. "I am a proud son of South Bend, Indiana, and I am running for President of the United States." The historic — and rainy — announcement came amid a lineup of speeches from other mayors, including Christopher Cabaldon of West Sacramento and other notables like Renee Ferguson, a past mentor of Buttigieg’s. Cabaldon’s impassioned speech pointed out, not only how historic Buttigieg’s run was but also how the run would contrast with laws on the books that, in a majority of America, allow for housing discrimination against LGBTQ+ people. Policies that would bar Buttigieg or his husband Chasten from donating blood in the wake of a Pulse-style massacre. It’s in this context that the 37-year-old Buttigieg, who announced a presidential exploratory committee in January, officially announced his bid for the Democratic nomination. Should he be successful, he would become the first out gay presidential nominee from a major party.